Carhartt has been a pioneer in Men’s work clothing since 1889. Carhartt has been symomise with tough, rugged clothing that out lasts the competition. We stock jeans, pants, jackets, hoodies, button down shirts, t-shirts, vests, hats, socks, collar shirts, and more. 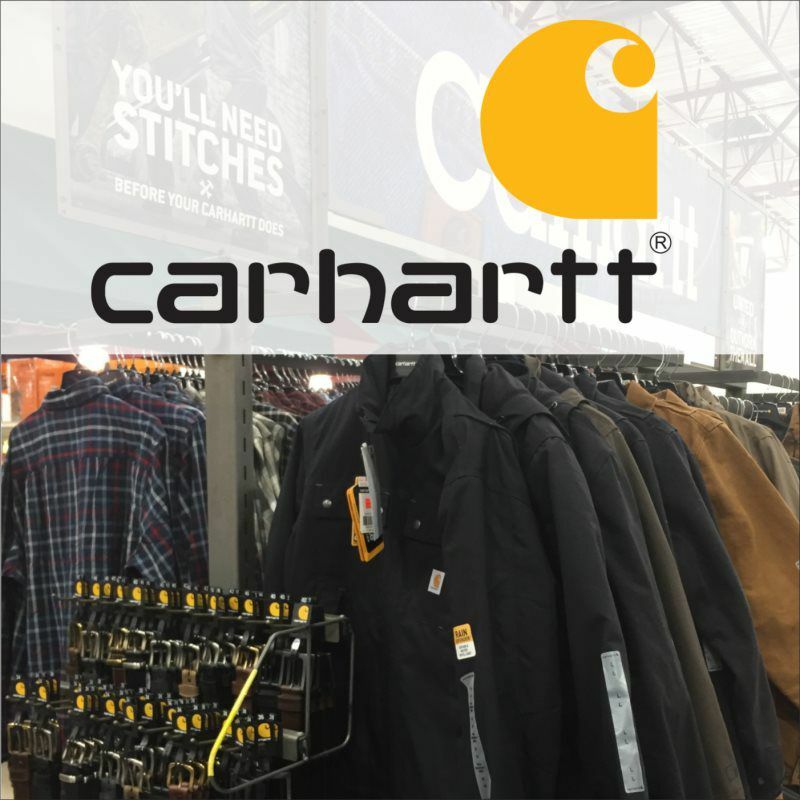 Stop by our Hardware Department and see our huge selection of Carhartt clothing that is forever changing based on the seasons. If we do not have a particular size or color that you are looking for, we can special order anything that you would like and have it within a couple of weeks (based on availability). • Wall-mount units run $229-$299. Gaines offers a variety of high quality mailbox and address plaques that make a great statement to any home! All their top end mailboxes are manufactured from high-grade aluminum and finished with a durable, weather-resistant powder-coated finish. Gaines’ high end series of mailboxes are available in a variety of different styles and color options (Choose a primary and secondary (accent) color). We stock some of the wall-mount box options for immediate purchase, but don’t stock the free standing units due to the amount of color options available and the fact that most customers will choose to add an address number to the free standing units. Note: an address number is not an option on the wall-mountable units. Additionally lock boxes are available for purchase with any of their units. Wall-mount units run between $229-$299. Free standing units with a post will run $400-$600 for a single box and more for multiple boxes. 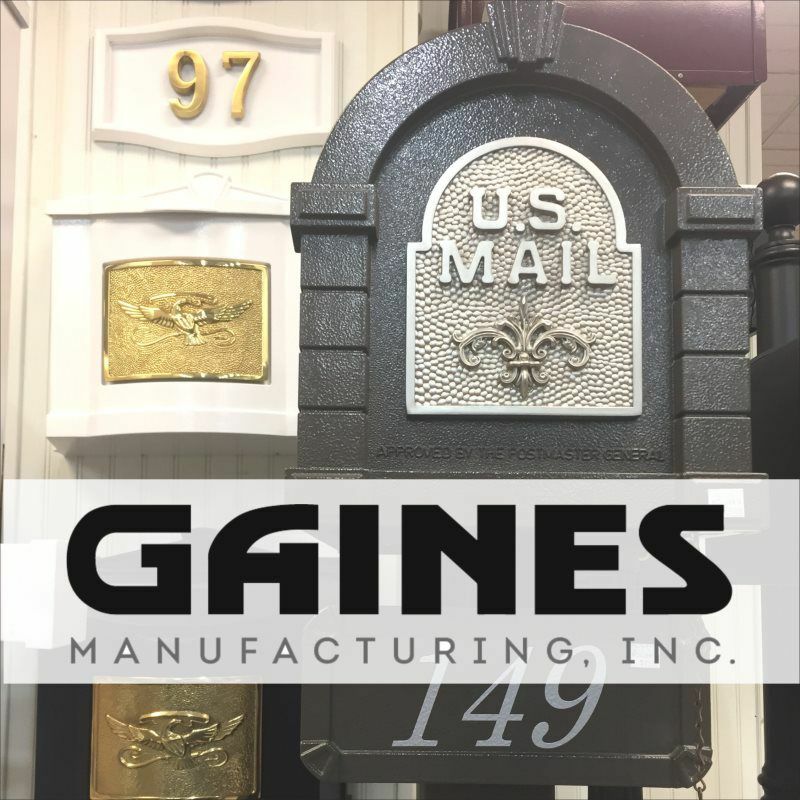 Stop in and check out our display which features a variety of Gaines premium style mailboxes along with address plaques to help you make the best choice for your home. Color swatches of all the finish variations are available for you to help make the right color combination selection. • Whitehall has over 70 years of manufacturing excellence and is the largest manufacturer of personalized plaques! • Each plaque is manufactured in the USA from rust-free, recycled aluminum. • Stop in and check out or impressive display! 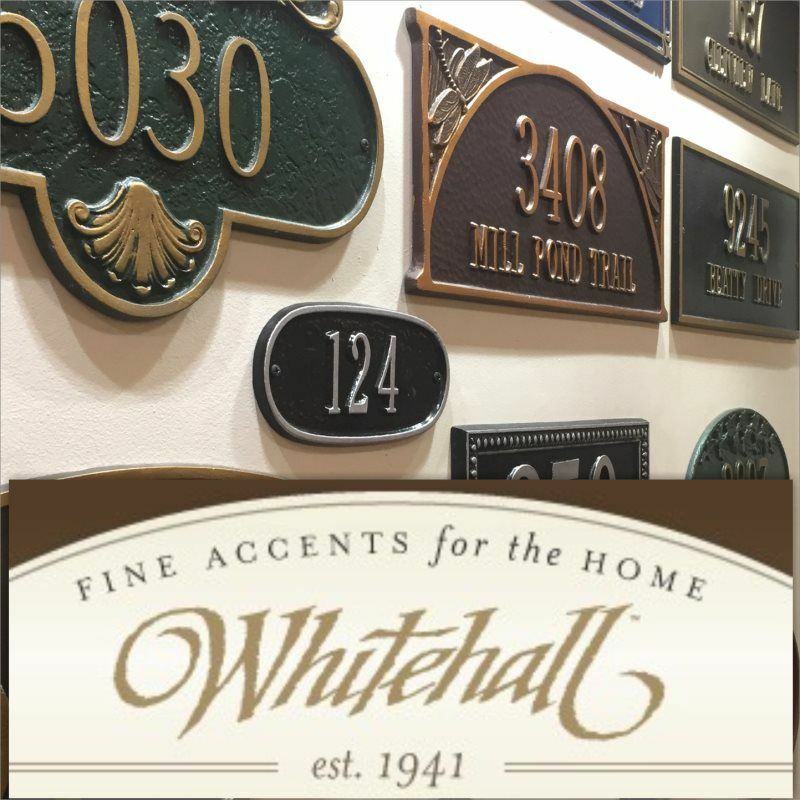 Whitehall is the largest manufacturer of personalized address plaques with over 70 years of manufacturing excellence! Each plaque is manufactured in the USA from rust-free, recycled aluminum. Finishing paints have been tested to withstand the harshest elements. Choose from over 100 designs and 17 different color options! All plaques are made to order. Many of their options are very reasonably priced ($60-$100). Not bad for a custom designed address plaque! All of the plaques can mount to a wall and a good variety of them have a lawn stake option. Orders typically take 4-5 weeks to arrive at our store from the time you place your order. Stop in today and check out our impressive display of Whitehall plaques! Many of their most popular designs are on display at our store along with each and every color combination option to help you make the right choice! In addition, an order catalog from Whitehall displays all their address plaque options along with specs for each design. Whitehall is most well known for their address plaques, but they also manufacture a variety of hose hangers, sundials, weather-vanes and mailboxes. While we do stock a few of their hose hangers in our store, most of these products, like the rest of the line, are custom order. Want to take a further look at their products prior to stopping in? Check out Whitehall Products online. Special In-Store Offer: Save 10% on your purchase of Easy Track Closet Organization items. The easiest way to reorganize your closet is now at Rollier’s. It is called Easy Track and you can have a brand new closet, pantry, or utility room in as little as one day! 1) Simply install the Easy Track Rail to the studs on your wall. 2) Hang the Easy Track panels on the rail by using the pre-cut slots on each panel. No tools necessary. 3) Connect panels together with shelves, rods, and drawers. Add accessories to customize your space. 4) Enjoy your newly organized space. If changes need made, the kit is easy to adjust to your new demands. Customizable: Begin with a starter kit and then add to it all the drawers, panels, shelves, baskets, hampers, and clothes rods that you would like to make it fit your space and your needs. If you need to make room for 6 new pairs of shoes or 12 new shirts, you have the ability to change the set up to fit your new demands! A few minutes of your time and your will be able to reorganize your closet based on the season. There are hundreds of different set-ups, and Easy Track allows you to choose what is best for you. Quality: All Easy Track products are made in the USA from the highest quality materials to exact tolerances. They use commercial grade composite panels with a durable, thermally fused laminate surface (available in three colors – white, truffle, and weathered grey. In fact, a 8 foot rail can hold more than 1,200 pounds! All Easy Track products are backed with a limited lifetime warranty. For more information on the Easy Track system, please visit their website at www.EasyTrack.com. 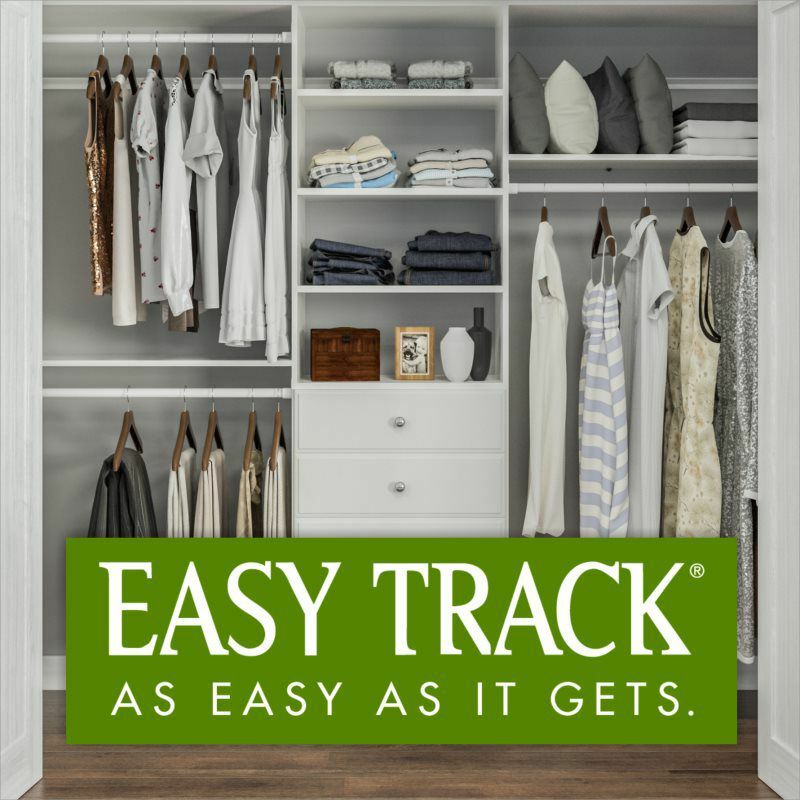 Please view the video below for a quick demonstration on how quick and easy it is to design and install your new Easy Track closet organization system.